Coffee Break is the name of our toddler group which has been running now for over forty years. We meet each Tuesday morning in the Church Hall in Malling Road (opposite St Katharine’s Lane) between 10am and 12. If you are the parent, grandparent or carer of a baby or young child and are looking for something to do, you would be made very welcome. There are lots of activities for the little ones and a chance for the grownups to relax and chat. JaM stands for ‘Jesus and Me’. 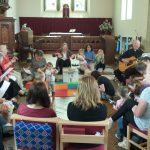 Once a month, on the 3rd Tuesday, families who come to Coffee Break gather in the church next door for a short, child-friendly and interactive act of worship. There are songs, stories and games and a blessing. It is a fun and safe way for little ones to learn a something Jesus and faith and it lasts about twenty minutes. There is no need to worry about how your child will behave and you are more than welcome to come along and sit and just watch. 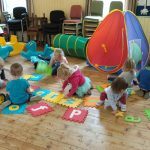 Holborough Coffee Break is a mother and toddler group that meets in the Village Hall at Holborough every Wednesday morning during term time , between 10am and 12 noon. Mothers and carers of children age 0 to 4 are warmly welcomed. On the 3rd Wednesday of the month we hold a short JaM (Jesus and Me) service at 11.30 am with a story, singing and a prayer to finish the morning with enthusiastic contributions by the children and their instruments .